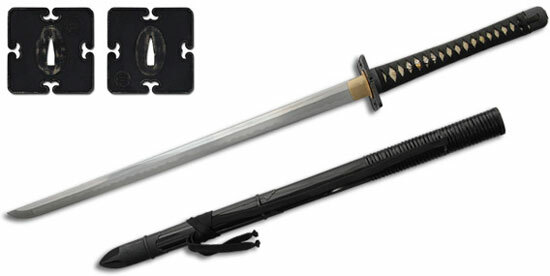 Iga Ninja-To Swords for sale are 33 inches in all and weigh 2 pounds 3 ounces. These popular swords are from the series designed to commemorate the warring ninja families of the Kouga and Iga clans of feudal Japan. They feature a functional 22 inch 1566 forged high carbon steel blade. The sharpened blade is differentially quenched to an edge hardness of 60HRc. They have a double pegged dismountable tsuka. The 10 ½ inch handle features a traditional wrap over natural rayskin with a clouds, sun, water and moon themed Menuki. The blackened iron Tsuba featuring the Iga Mon and a wave motif. The black wooden scabbard features a reinforced spiked end and is accented by a partial rattan wrap. These popular ninja swords are designed specifically for the Ninjutsu practitioner and feature premium fittings throughout. Buy the Iga Ninja-To Swords for $399.99.